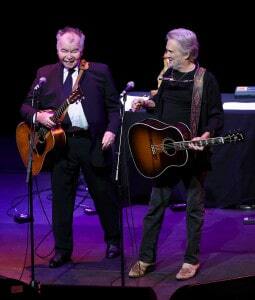 Kristofferson gave a shout out to Gene Kilroy during his appearance with John Prine at The Pearl Concert Theater at Palms Casino Resort last Friday night, according to a recent article. Fans are aware that Kris Kristofferson is battling with memory loss, he has been candid about his condition for sometime. The news has been sad & difficult to accept, & it must be unbelievably harsh on his family & personal friends. His music & songs have, for some reason, been largely unaffected by his condition & there is even strong evidence that there is a new release in the pipeline, an album expected to include some new songs. In light of this, the headline, Kristofferson Remembers immediately grabbed my attention. Neurological & conditions that affect the brain remain tricky to understand & treat even in this day & age. Many of the singer/songwriters fans are getting to the stage in life where they themselves are either experiencing some degree of memory loss themselves, or are dealing/have dealt with loved ones who are fighting similar battles. For many fans, Kris has walked through their life stages with them, so as tragic as this challenge is for everyone concerned, he continues to walk the road with us. He has always communicated, through his art, like he is one of us – the people. Fragile, questioning, lost a lot, grateful for what he has achieved, battered by the knocks of life, & having great regard for the love of his family & friends. Intrigued by the heading, I clicked this link which lead to the article by Norm Clarke of the Las-Vegas Review Journal. It was an odd read, & seemed disjoint, but halfway down I found some snippets that you might be interested in. After finding the relevant bit, I needed more context. Who is Gene Kilroy & what is his connection to Kris Kristofferson? In April 2015, Norm Clarke mentioned near the end of a post that Kris & Lisa had been seen dining with Gene Kilroy at Fiamma, a Trattoria & Bar MGM Grand restaurant at 3799 Las Vegas Monorail, Las Vegas. Kris & Kilroy are obviously in touch & seemingly family friends. Gene Kilroy met Cassius Clay at the 1960 Olympic games. Kris, himself a Golden Gloves boxer, saw the fighter win his gold medal at the same games, but never met Kilroy. Gene Kilroy & Kris Kristofferson are both close friends of Muhammad Ali. Kris mentions Ali on his DVD. Harold Conrad, in this article in Rolling Stone (Feb 1982) speaking after the fighter won his title back from Leon Spinks in 1978, mentions that Kris was one of the many people who encouraged him to retire. The same article refers to Kilroy as Ali’s “friend & confidant”. It is an excellent if somewhat sad read, but it does highlight Ali’s generosity. Freedom Road, the 4 hour TV drama starring Ali & Kristofferson was released in 1979, so it would have been filmed right before the incident mentioned in the above interview. It is clear that Kris was a close friend of Ali’s. Kris said, in a 1970s Rodderick Mann interview for the Spokane Daily Chronicle that he had learnt a lot about dealing with people from Ali, & that “Muhammad & I were together every day & here’s a guy who refuses to turn anybody away asking for an autograph. He’s got a greater sense of obligation to the public than any star I know.” Producer Zev Brown is referenced as saying that Kris acted as coach to Ali & assistant to many others. (see article for details) Kris never wanted to do the movie, but agreed after Kilroy told him that if the movie failed, that Ali would probably return to boxing. Kris initially did the movie to keep Ali out of the ring, but was later glad he had. The article is a wonderful opportunity for fans to remember where Kris was at in the ’70s, & it’s a read that I strongly recommend. Do yourself a favour & click the blue link, let me know what you think? Kris & Ali had a lot in common, but perhaps the biggest tie was a combination of a love for boxing & a social conscience. Ali was imprisoned for refusing to fight in Vietnam. He admired black freedom fighter Jomo Kenyatta, Fidel Castro & Mao Tse Tung, so he fell foul of the establishment. Perhaps Ali’s early outspoken manner had an impact on Kris who has often been isolated for his political views & supporting unpopular causes. They now share the challenge of living with brain disease. Kilroy is always referred to as a lot more than Ali’s business manager. They were & remain good friends, so close that Kilroy was pallbearer at the funeral of the mother of Muhammad Ali. Kris Kristofferson, Gene Kilroy & Muhammad Ali are close friends. In the article, it is reported that last Friday, while Kris was doing his show at the Pearl as part of his current tour with John Prine, he specifically mentioned Gene Kilroy. The shout out was made while Kilroy was in the audience. Gene Kilroy is referred to as Ali’s former business manager, & a casino host, & it states that Kris & Kilroy are long-standing friends who share a love of boxing. Both men were at the 1960 games, Kilroy in capacity as the US team Paymaster. Kilroy recruited Kris for “Freedom Road”. The movie has Ali playing a slave who becomes a soldier, then a South Carolina senator after the Civil War. Photo credit Ethan Miller, used with kind permission. All rights reserved.